Visitors to Olympic National Park must pay $20.00 for an Olympic National Park Entrance Pass that is valid for one week from purchase. Why not get the most of those $15? Here is a suggested itinerary for those seeking priceless moments in some of the most beautiful untouched nature on the earth. This is not just my opinion. Other big fans of Olympic National Park were President Franklin D. Roosevelt, who fought to protect the forests from the interests of railroad and timber barons, founding Olympic National Park in 1938, and UNESCO, who designated the park a “World Heritage Site” in 1981. Enjoy the view, purchase your pass, rent a bear can for your food, pick up your copy of The Bugler, chat with Ranger about the week's plan - they may have updated information about any road or trails closures as well as interesting Ranger Programs. Hurricane Meadow Walk: Join the friendly Park Rangers on an easy 1.5 mile journey around a beautiful wildflower meadow. This trail features fantastic views of the snowcapped Olympic mountains and, on clear days, the stunning waters of the Strait of Juan de Fuca. Switchback Trail: Feeling a bit more adventurous? Take the Switchback Trail to Klahane Ridge. On this more strenuous 5 mile trail, you will get to enjoy the views of the valleys within the Olympic Mountain range, glaciers, waterfalls, and the wildflower laden cliffs of Lillian Ridge. Enjoy the clear waters of this glacier carved lake by renting a row boat from the Lake Crescent Lodge. On the lake, you can admire the giant fir and hemock trees around the lake. The lodge does not rent fishing equipment, nor Washington fishing licences, but with a little planning you can enjoy a day of fishing as well. Hike one and a half miles below giant trees and across a mossy bridge over rushing Barnes Creek to Marymere Falls. Visitors can enjoy getting a bit wet near the base of the falls, or can climb a rigorous set of stairs to a viewpoint the top of the 90 foot tall waterfall. Cape Flattery is the most northwestern point in the contiguous United States and is a natural wonder. Located on the Makah Reservation, visitors must purchase a $10.00 pass upon entering the reservation. These funds allow the Makah to maintain trails and roads that visitors use in the reservation. Stop at the Makah Research and Cultural Center where you can view 500 year old artifacts and learn about the rich culture and traditions that the Makah have kept alive for more than 2,000 years. A short drive from the Cultural Center is the Cape Flattery Trail. This trail of wood planked boardwalk and stone steps offers visitors breathtaking views of waves crashing against the beautiful seastacks. Part of the Olympic Coast National Marine Sanctuary, the four lookout points along Cape Flattery Trail are fantastic spots to see wildlife; bald eagles, puffins, seals, and otters are frequent sights in the summer. After three days of hiking, exploring, and driving, it's time to sit back and relax. Sol Duc Hot Springs Resort is famous for its three natural hot mineral pools and one freshwater pool. If you are staying at the resort you do not to pay extra to enjoy the pools. Adults will enjoy relaxing in the hot pools, while the freshwater pool is cannonball friendly for children. Craving a bit of pampering? Massage therapists are on staff to soothe your sore muscles. The pools can get a bit crowded in the early afternoon, so if you find yourself needing a bit of space make your escape to the beautiful Sol Duc Trail. This trail runs along the raging Sol Duc River to Sol Duc Falls, a powerful, three pronged waterfall. When I visited the falls, I witnessed a marriage proposal on the rustic bridge overlooking the falls. The falls did provide a very romantic background to the event, but humorously, the crashing water was so loud that the young lady did not hear the question and the poor kneeling fellow could not hear the his girlfriend's answer. After some tears and a comical pantomime, she put the ring on her finger and kissed her fiance. Witnesses clapped, but I'm pretty sure that they didn't hear us. Stay another night at the Sol Duc Hot Springs Resort or pitch a tent at one of the many riverside sites at Sol Duc Campground. It's time to take a beach day. Rialto Beach features stunning sights and wonders to discover. View colorful seastars, anemones, and other sea creatures in Rialto's many shallow tidepools. Next take a short walk along the beach to “Hole-in-the-Wall,” Olympic National Park's most famous sea-arch. Because of its accessibility and beauty, Rialto is one of Washington's most popular beaches. If you are having a hard time finding parking or just want a bit of beach to yourself, the nearby beaches of La Push are less often visited, but are just a beautiful. At the La Push Beaches, you can hike along a coastal trail through sitka spruce to Strawberry Bay Falls, a tall waterfall that crashes directly into the ocean. One of the best moments of my Olympic Penninsula trip was spent sitting on a large driftwood log, quietly admiring the waves crashing into the green, wave carved seastacks, just off shore. The beautiful La Push beaches appeared in the famous teen-vampire saga, Twilight. If you or someone you are traveling with is a “Twi-hard,” make sure to stop in the nearby town of Forks, Washington. The main setting of the books, Forks features numerous tours, landmarks (get your picture next to “Bella Swan's Truck!”), and two stores selling all items having to do with the books called, Dazzeled by Twilight and Native to Twilight. Forks can be enjoyed by those who are neither a fan of Team Edward, nor Team Jacob. The small town features charming shops that sell art, traditional crafts, and jewelry. There are a number of dinners and bakeries located along Forks Avenue that feature fluffy pasteries and satisfying comfort food. If it's not raining, you are scared of local vampire attack, or if you enjoy the sleeping to the pitter-pat of rain drops, camp in the lush Hoh Rainforest at the Hoh Campgrounds. Explore the unusual plant life under the rainforest canopy along this 1.2 mile trail. On this trail, you will feel as though you entered a new magical world as you pass large, colorful fungi, octopus armed air-plants that feed off the air's moisture, not nutrients from the soil, and thick curtains of moss. Hike the Hoh River Trail 5.3 miles along the rushing Hoh River to Five Mile Island. Five Mile Island is a beautiful island formed by converging river channels. This is a great spot to enjoy a sack lunch on the grassy shore under the shade of a maple tree. The sounds of the churning Hoh River and the singing of the local thrushes and wrens make for a lovely soundtrack. 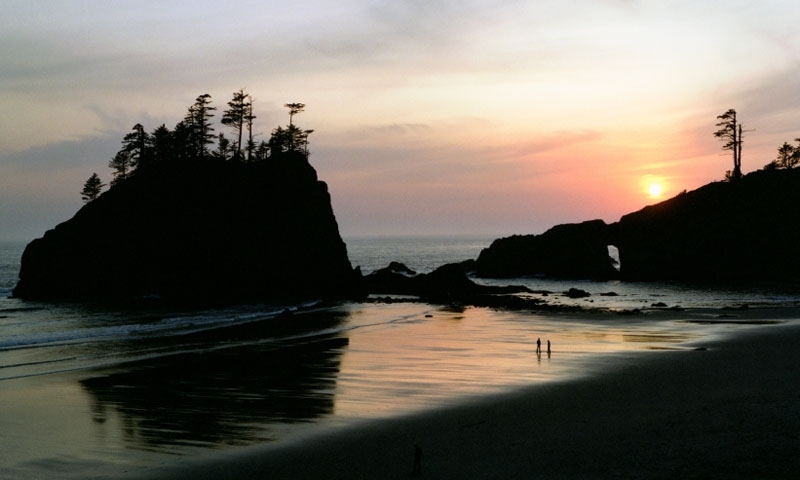 Kalaloch Campgrounds: Kalaloch Campgrounds are the most beautiful and most sought after campgrounds in Olympic National Park. These sites are located on bluffs overlooking the beach, but are spaced apart for privacy. These are the only campgrounds that require a reservation for summer camping. South Beach Campgrounds: Forgot to get reservations six months ago? Nearby South Beach also has great camping near the beach. South Beach is a little less scenic than Kalaloch, but campers don't need to make a reservation to get one of the 50 camp sites. Sadly, your week in Olympic National Park is almost up, so it's time to start driving south to I-5, or if you are one of our Canadian mates from up north, around the Olympic Highway, WA-101 to the ferry at Port Angeles. Need directions home? The friendly folks at the Lake Quinault Lodge are happy to point you in the right direction.